Preparing grilled vegetables for weeknight dinners or weekend dinner parties is as simple as choosing your vegetable and then pairing it with an easy-to-make dip or vinaigrette dressing. Alternatively, you can also pair grilled vegetables with a variety of cheeses, grilled meats, seafood or tofu. First, it is important to learn how to properly grill your vegetables. Different types of veggies need different preparations, cooking times and temperatures. 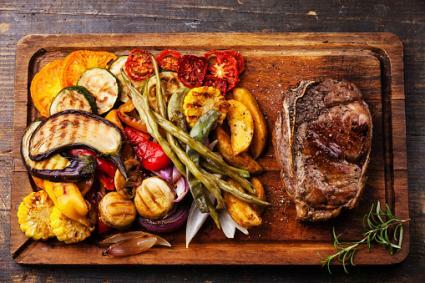 Whether you are grilling asparagus, tomatoes or corn, browse through a few cookbooks or discover Grilling Vegetable Tips online. Zest lemon peel with a microplane grater and set aside. Divide asparagus into four different bunches. Align them in a flat row and thread two wooden skewers (previously soaking the skewers in warm water for about 10 minutes), through each bunch. Brush the four separate bundles with olive oil, sprinkle with kosher salt and place them on the grill. Cook for about two to three minutes on each side, remove from grill and arrange on a platter. This recipe has a wonderful basting sauce. For variations, try different citrus juices, such as orange or lime, and different fresh herbs, like basil, chives, tarragon or oregano. Combine butter, shallots, olive oil, mustard, lemon juice, thyme and zest in a medium saucepan and whisk constantly over medium heat until butter melts and the ingredients are well blended together. Set aside about 1/2 cup of the sauce for dipping and then toss all of the vegetables with the rest of the sauce, coating each piece. Prepare grill to medium high heat, and grill vegetables until lightly charred, turning occasionally, for about 6 minutes. Transfer veggies to a platter and add a bowl of the sauce to the center for dipping. Aioli is a traditional French sauce that is usually made by whisking oil, eggs, mustard and garlic into an emulsion, but you can make your own quick version by combining a high-quality mayonnaise with garlic and lemon juice. Whisk mayonnaise, garlic and lemon juice to blend together. Set aside. Prepare grill to medium high heat. Brush cut sides of tomatoes with olive oil, and place face-down on grill. Cover grill and cook tomatoes until hot and tender, about 3 minutes on each side. In a small bowl, whisk the butter, lemon zest and juice together to combine. Prepare grill to medium-high heat and peel back corn husks without breaking off the husk, discard corn silks. Return husks to cover the ears of corn and tie the ends together with kitchen string. Cover corn with cold water and soak for 10 minutes. Drain and place on grill turning occasionally, for about 15 minutes. Remove husks and brush with lemon butter mixture. Season with salt and pepper and serve warm. Once you have the basics down, the possibilities for a variety of simple recipes are endless. Just have fun experimenting, and don't be afraid to try different combinations.